In the book, Trader Vic - Methods of a Wall Street Master, Victor Sperandeo gives three steps for identifying a change in trend. This three-step method will help you avoid losing trades and find great trading opportunities. It correctly predicts a trend change 60 to 80% of the time. So, this is definitely worth learning! There is a retest and failure. 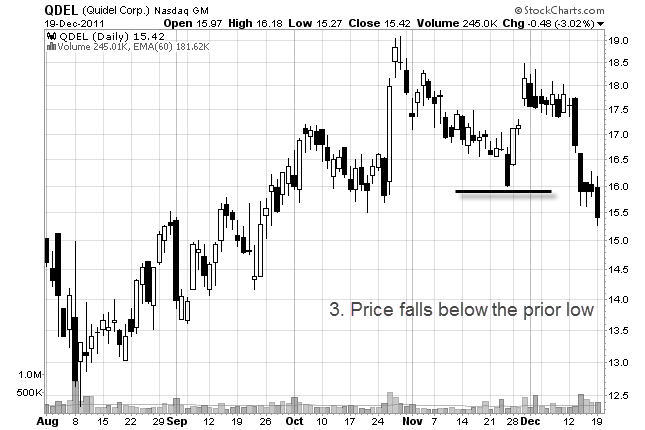 These three steps define a stock that has moved from an uptrend to a downtrend. Learn these three steps and you will never trade on the wrong side of the trend again. This chart shows that the trendline has been broken. The trend has not changed yet. Stocks will often break a trendline and then continue to move in the direction of the prevailing trend. At this point we are concerned about the trend - but we do not know if the trend will change. We know that a stock in an uptrend makes higher highs and higher lows. 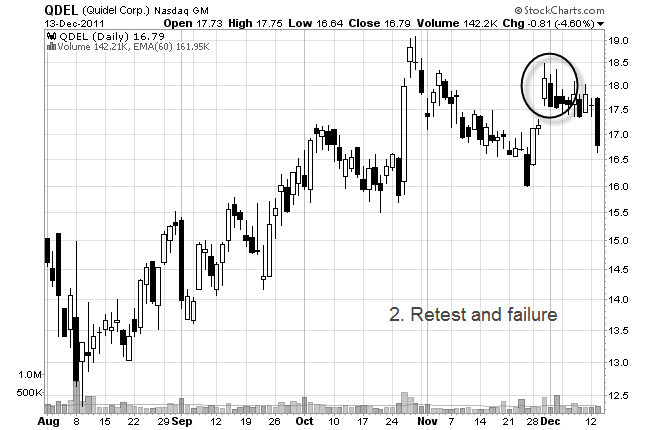 When a stock fails to do this, we should be begin to question the trend. This stock has now tested that prior high - and failed. So, this stock is no longer making higher highs. But, it is not making lower lows either! So far, there is no confirmation that the trend has changed. This stock has now fallen below the previous swing low. We now have confirmation that the trend has changed. Why? Because this stock is now making lower highs and lower lows. And that is the definition of a downtrend! 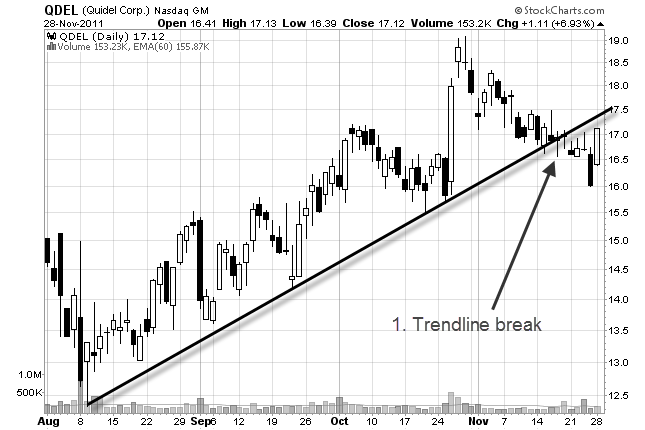 This trend change example shows a stock moving from an uptrend to a downtrend. 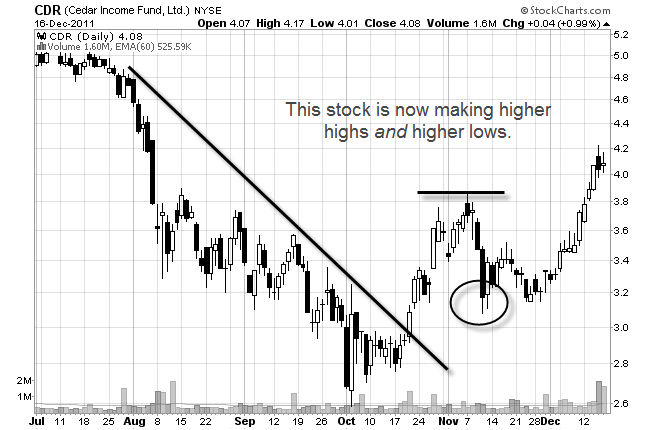 What about a stock that moves from a downtrend to an uptrend? It's official. 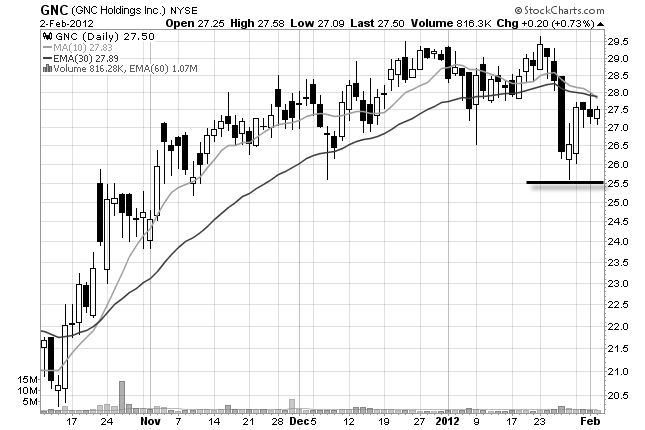 This stock is now in an uptrend because it is making higher highs and higher lows. How does this help you as a swing trader? First, you want to be cautious of swing trading stocks after a trendline break. You can still trade them but watch carefully to see what happens next. If there is a retest and failure, the trend might change. If the trend does change, then you might consider trading it in the opposite direction. Second, you want to trade stocks that are at the beginning of the trend because these stocks have the most potential for explosive moves. How do you find these stocks? Using Trader Vic's 3-step method will help you find winning trades and avoid losing ones. Memorize it, and you will be able to spot trend changes instantly just by glancing at a stock chart. Master it, and you'll be able to jump onto a trend...long before the crowd does.